Linux distributions need to walk a fine line. On the one hand users want rock-solid foundations; this is why conservative distros like Debian have long ruled the server. But on the other hand, you want the most up-to-date apps on your desktop, hence the popularity of Ubuntu (rather than Debian) for laptops and PCs. This can actually be refined a bit more, because the ideal would be to take the underlying tools, the low-level system elements from something really conservative and stable and the userland applications from a latest and greatest source. If that sounds ideal to you then you might want to have a look at the new project from openSUSE: openSUSE Leap – due next month but now in beta. The core of Leap is SUSE Enterprise Linux, but the userland applications are maintained by openSUSE. The project notes explain Leap as a way to secure "the future of openSUSE". "Maintaining a distribution is a lot of work," said the openSUSE Leap wiki, "by basing openSUSE on SLE (SUSE Linux Enterprise), the core of openSUSE will be maintained by SUSE engineers ... The openSUSE project can then replace and add the bits and pieces of software that contributors want and are willing to maintain." In other words, Leap is the middle ground between the cutting edge Tumbleweed and very conservative SUSE Linux Enterprise. Tumbleweed will still be there for those who want bleeding edge updates, but for most Leap looks like the future of openSUSE. Somewhat confusingly for new users, the first version of Leap is openSUSE Leap 42.1. The decision to start at 42 is something of a joke (those that have read The Hitchhiker's Guide to the Galaxy will get it) and an acknowledgement that version numbers are essentially meaningless, but the .1 after it is not. The .1 is tied to SUSE Linux Enterprise 12 SP1. The next release of Leap will be 42.2 and tied to SUSE Linux Enterprise SP2. I took the Leap beta release for a spin and found that for the most part Leap is what you would expect from openSUSE – a well-themed KDE desktop, a full compliment of applications and some thoughtful extras. 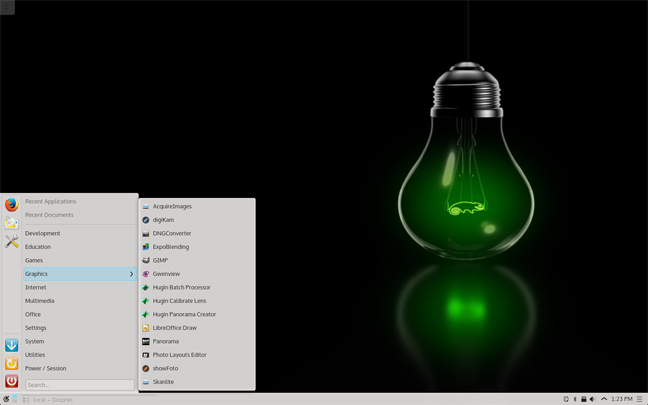 Leap has the familiar openSUSE attention to detail and the level of polish that's leaps and bounds beyond what most distros offer. The first thing you'll notice when installing Leap is openSUSE's installer has been updated with a few new features. Out of the box, the installer will now give you a root partition formatted in btrfs and home partition in XFS. You can also opt for any of the familiar drive formats, like ext4. 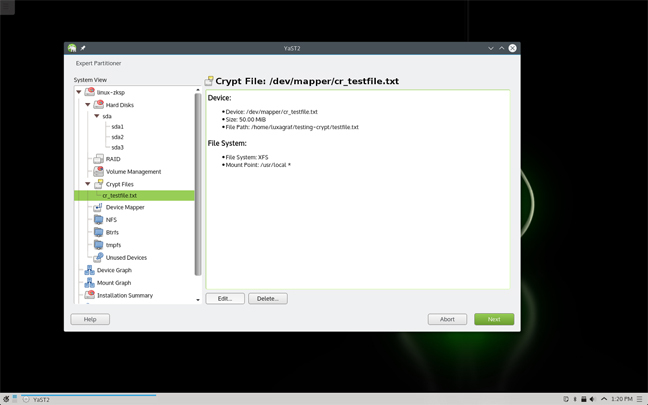 The openSUSE installer also lets you know what encryption type it's using for your password, which is a nice touch. I opted to test Leap with KDE because, I think, openSUSE's KDE desktop is one of the slickest KDE implementations around. That said, Leap's current incarnation is a bit different than the openSUSE 13.2 version I've used in the past. Leap takes a leaner approach with fewer default widgets, a simplified main menu (use KDE's App Menu instead of the full Launcher) and less green theming overall. It was still a great KDE setup, but perhaps a little less polished than usual. Leap is of course still a beta release, which may explain some of the pared down feel. Some of that could also be that Leap's KDE is living up to the promise of the latest and greatest from userland with Plasma 5.4, Plasma Framework 5.13, and the new Breeze theme for KDE. The "flatter" Breeze theme may not lend itself to as much customisation since it has a very distinctive look and feel. Tweaking even a small part of it would likely mean a lot of changes across apps. Fortunately, Breeze has a clean, simple look that fits well with openSUSE's very professional feel. If KDE isn't to your liking, Leap has plenty of other options in the repos, including a GNOME-based version, Xfce, LXDE (even LXQT if you want to live on the edge) MATE and Enlightenment. The kernel in Leap is also a bit ahead of SUSE Linux Enterprise. Leap first beta uses the 4.1.x series kernel, which has some huge improvements for ARM-based systems as well as the usual updates for the latest hardware. A few things were not entirely current in the beta – like Firefox, which is still at version 40 (version 41 was the latest release when I tested). But, by and large, Leap does appear to be getting really close to that ideal of a stable base system with all the latest packages available as well. All the things that make openSUSE great are in Leap as well, including the powerful YaST management system. YaST makes tweaking your system a snap and has some great tools you won't find in most other systems. For example, every time you update packages in Leap (or openSUSE) behind the scenes the Snapper tool takes a Btrfs snapshot (assuming you stuck with the default Btrfs format for your root partition that is). That means you can quickly and easily roll back your system if you break something. YaST also has some of the best GUI tools for managing encrypted volumes, something that can be a huge pain in other distros.